Placing your parent or parents in a nursing home may be one of the most difficult and traumatic events of your life. However, if you understand what is involved, the needs of your parent(s) and a number of other factors, it may help make the decision a little easier. You're likely to feel guilty over the decision, and that's normal. However, the safety and care of your parent is the most important factor when making this decision. Talk to them about your concerns regarding specialized care or your own challenges in providing such care. Some parents don't want to be a burden on their children and may insist on a nursing home, while others may accuse you of betraying them and wanting to get rid of them because they're a burden. Caregivers dealing with incontinent parents or those diagnosed with a form of dementia should decide when it's time, suggests "The Early Show" and CBSNews.com. Take the time to find the right nursing home for your parents. Your choice should be based on the types of services offered by the nursing home. A nursing home should offer a secure and safe environment for your parent. If your Mom has dementia or Alzheimer's, find out if there is a secure wing or section of the facility that will provide a safe and calm environment for your Mom. Visit a number of facilities in your area. Watch the interaction between residents and staff. Look around to make sure elders are not left sitting by themselves for long periods of time. Watch to see how quickly call lights are answered by nurses or nurse's aides. If both of your parents are to be admitted, ask if they can be placed together. Determine meal schedules and whether your parents' dietary needs will be met. Ask if nurses are provided 24/7, and what steps are taking in the event of a medical emergency. 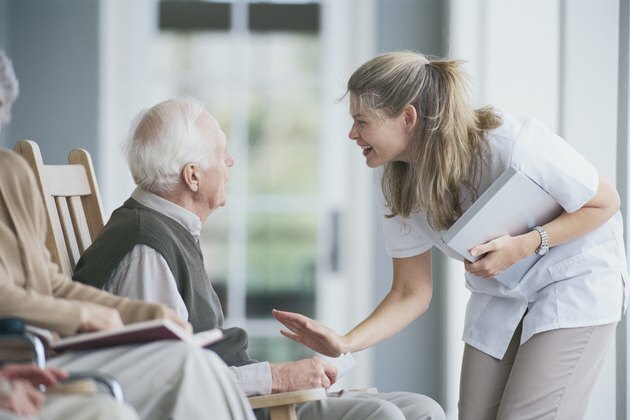 Talk to the nursing home administrator about placement and steps to follow to admit your parents to the facility. Prepare yourself mentally when it's time to drive or transport your elderly parent to the nursing home. Be prepared for feelings of guilt and doubt. You may know you're doing the right thing for your parent's ultimate safety and security, but that may not make you feel better. Your parents will most likely express a number of feelings, including anger, tears, begging and, sometimes, silence. Visit your parents on a regular basis, and call them when you can't. Let them know they are not forgotten. Keep them involved in your life as much as possible, especially if you live nearby.